You light it, we'll write it. Strict enforcement of the ordinance. Please, no fireworks! The illegal discharge of fireworks within city limits can pose significant risk of personal injury, fire and disturbing the peace and tranquility of neighborhoods. Prohibited fireworks will be seized and violators will face substantial forfeitures. 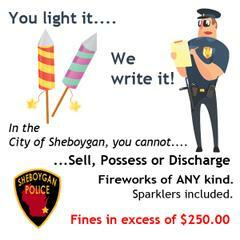 The Sheboygan Police Department wishes for all residents and visitors to the city to have a safe and enjoyable holiday.